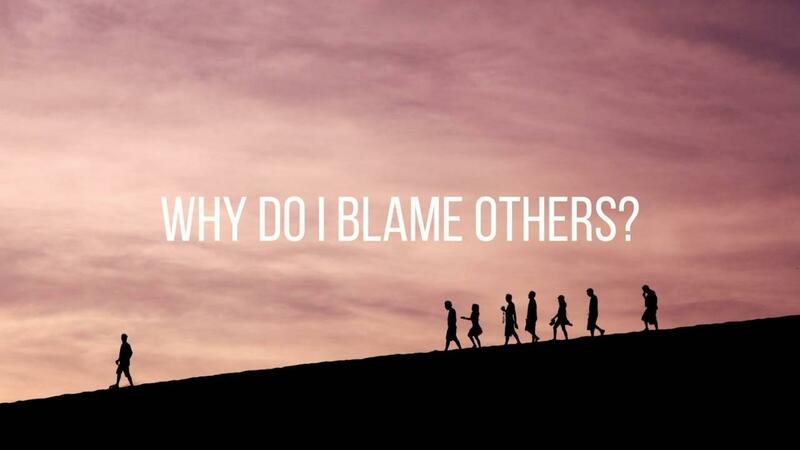 Why Do I Blame Others? I posted a blog a few days ago and challenged you to read 1 Timothy 3:1-13 (Passion Version) and then I listed all the leadership principles that are mentioned in that passage. Now, I want to look at each quality individually to see how we can use them to grow as leaders. The first characteristic listed is to be "Without Blame - Well Thought Of." I love how practical these are even in our lives today. We're going to look at each principle in 3 areas we need to lead in: Ourself, Our Family, and Our Workplace. How do you think of yourself? Do you think well of yourself? Many people don't think well of themselves, yet the Bible commands us to love others as we love ourselves. If we're not loving ourselves, how can we love our family and those we work with and lead? A few years ago I started listening to how I talked about myself. I realized that I was negative and not very encouraging to myself. I would do something and then beat myself up for how I did it, "I should have done it differently. Why did I do that? Why did I do it that way?"....etc. Or I would blame myself for everybody else's problem. "If I hadn't of done ________ then they wouldn't be struggling." You get the picture. So if I don't think well of myself and I'm blaming myself for everything wrong in my life, how can I lead from a place of health? So, I had to make a change! I started talking to myself in a life-giving encouraging way. I started speaking God's word over myself. I am called, I am chosen, God loves me, God likes me. From there my mind began to change. God's taught me this: Yes, I've messed up and there were times I hurt people, but Jesus took my punishment on the cross. I wasn't doing myself any good talking down to myself as punishment. I had to declare, "I am the righteousness of Christ, I am a daughter of the King" (and so many other truth's.) From this, I learned who I am. I had to trust God that He would redeem and restore all the years the locust had eaten. In other words the times I messed up God would fix and make right. So, if He told me to go ask for forgiveness, I had to go and do that. If He told me to call and just have a conversation with someone, I had to go do that. I had to realize that everybody's else wrong decisions were not my fault, I had to stop blaming myself and start praying for people. As I started loving myself, it was easier to love others. It's hard to be around people who don't take ownership and put blame on others for their issues. Many people think if I had a different spouse, different kids, a different job, my life would be better. Sadly this isn't true, simply because you take you with you wherever you go. What do you find yourself blaming others for at home and work? Next time you feel yourself doing this, stop and look deep inside yourself to see why you feel as if you have to blame others, and can't take ownership. What insecurity is causing you to blame others? When you become the kind of person that takes ownership, even for the small things and doesn't blame others for your issues or issues that arise, you will begin to flourish as a leader. I challenge you to go encourage somebody with your words right after you read this. P.S. Sign up HERE for a FREE Coaching Strategy Session today!